Do not forget important birthdays ! Use Birthday, a birthday reminder; <br>At every startup of your computer it reminds you (in your own language !) <br>of recent birthdays you may not forget. Importing birthday data from database programs or other sources is simple. An extensive context sensitive help system is built in. <br>Speed buttons allow you to edit, insert or delete birthday data. 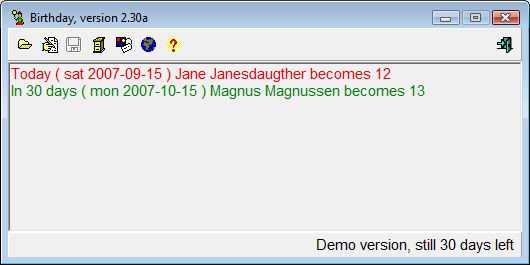 <br>The demo version is fully functional for 30 days.